The Beechcraft C-45 crashed during the brothel's promotional event in 1978. 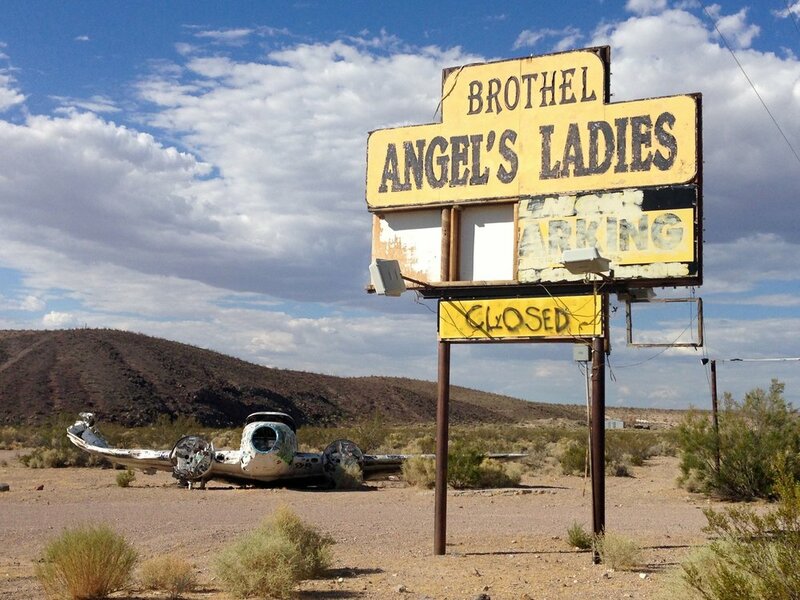 By the time the accident happened, the brothel was going by the name of Fran’s Star Ranch. The owners of the establishment did a challenge, where you could win a night with a lady of your choice. You just had to parachute out of the airplane and land on a mattress that was placed in the center of a large star painted on the desert floor. The crash resulted from a pilot's error. Rumor has it that he got distracted by the ladies and failed the heavy crosswind landing. Luckily no one was hurt in the accident. The owners decided to leave the wreck there. It would have been hard to remove, and he wanted to attract people from the road. The twin-engine plane is in pretty good condition when you consider it has been sitting out in the hot desert sun for almost 40 years. It is a little bit sun bleached, and target of graffiti vandals. The impact of the crash was so hard that the right aircraft wing bend. Large parts like the propeller and engine are missing. The parts and materials probably were recycled, or have been reused for other purposes. The brothel changed hands and names a few times. The owner retired, and finally closed the business in 2014, but the aircraft has stayed ever since the crash landing. It has shaped the history of this establishment and became an important part of the local landscape.